Project Spartan is taking over from Internet Explorer. Internet Explorer is the past - Project Spartan is the future. Microsoft's super-fast, clutter-free browser for the future is on its way and the Redmond company has just confirmed you'll be able to try it out yourself in the next preview release of Windows 10. When exactly that's going to drop is a matter of some speculation, but most rumors point to the end of this month, or perhaps even sooner. Microsoft's Kevin Gallo made the announcement at Mobile World Congress in Barcelona. We also saw a brief demo of Spartan running on a Windows Phone device at MWC today. 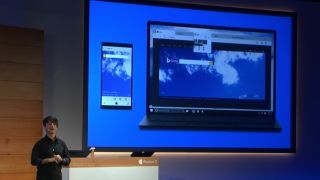 It looks very similar to the desktop edition, as you would expect with Microsoft aiming to stretch the same Windows 10 apps across all devices and screen sizes. So what can you expect from Project Spartan? The browser sports a darker, simpler skin and accepts pen and keyboard input right out of the (virtual) box. You'll be able to mark up web pages and share your notes with others. There's a reading mode, as with most other browsers, and offline support for caching sites if you want to catch up with your reading while you're away from a data connection. Cortana is directly integrated with the software, as you would probably expect, and Microsoft is working on getting the desktop version ready before it rolls it out to phones. Once the next Windows 10 Preview arrives, it will have a whole new army of beta testers to help out.